Asian Fashion Blog: calling all asian fashion fans in Leicester! 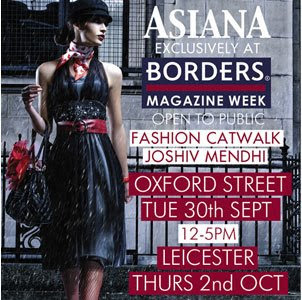 The bookshop Borders is having a "magazine week" and as part of their instore promotions, they're hosting a free Asiana Magazine fashion show in their Leicester store next week - Thursday 2nd October. Come along on Thursday, 2nd October from 12pm when Asiana magazine will be holding a mini fashion show, showcasing the best of Indian designers. The editor of Asiana will also be instore to answer any questions you might have, and we will have the industries top mendhi artist present on the day. In celebration of our Magazine Week, when all magazines will be on a Buy One Get One Half Price offer. I've always loved Asian style. Your blog is a great finding to me, thanks!